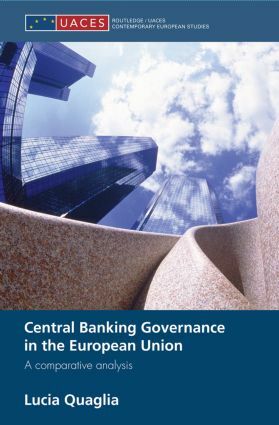 This book fills a gap in academic literature on the politics and public policy aspects of central banking in Europe, by conducting a theoretically-informed and empirically-grounded analysis of central banking governance before and after the establishment of the Economic and Monetary Union (EMU). The main framework for analysis is a ‘multi-level institutionalist approach’, articulated on three interconnected levels: the ‘systemic-level’, which encompasses the European, transnational and international arenas; the ‘national-level’, which considers the configuration of the domestic socio-economic and political environment in which each central bank operates; and the ‘micro-institutional level’, which deals with the specific features of each central bank. Empirically, this monograph focuses on the Bank of England, the Bundesbank, the Banca d'Italia and the ECB over the period 1979 to present, with particular attention paid to the last decade. It is grounded in in-depth and extensive primary research, enriched by interviews with policy-makers. Central Banking Governance in the European Union will be of interest to students and researchers of Politics, Economics and Political Economy. The Banca d’Italia: Quis custodiet ipsos custodes?